Imagine that one day with absolutely no warning, your life as you knew it ceases to exist. You are taken away from your home, your family, and your country and forced into involuntary servitude. Those around you are beaten for non-compliance while others fall sick and some even die. Chained, starved and abused, you and those who look like you are forced to do back-breaking labor, day in and day out for no pay. These days it is a bit hard to imagine something like this being allowed to happen, but this type of scenario was completely normal for thousands of years in many societies, including ours. The slave trade was an extremely popular way to furnish your labor force for free, especially here in the Americas. The young woman we are discussing today has a story much like what was previously described, but her life ended up in a most unlikely place. Escrava Anastacia was a female slave of African descent who lived in Brazil sometime during the 19th century. No one knows the true origins from whence she came, but there are a few different theories as to who she was and where she came from. Regardless of where she started, her life took many twists and turns as she was quite an anomaly for her time. She stood out for many reasons, but the most notable thing about her was the mask and collar that she was forced to wear during her lifetime. After her untimely death, the legacy she left behind inspired many of her fellow slaves, and Anastacia has since been worshiped as a saint of the Brazilian people in the centuries since. There has long been an air of mystery surrounding the beginning of Escrava Anastacia’s life. No one has pinpointed an exact date of birth or even the country in which she was born, but people have come up with a few different theories as to how she ended up where she did. One of the most widely known beliefs is that Anastacia was actually of royal blood. There are many who believe that she belonged to an African royal family before being brought to Brazil and enslaved. The second most popular belief is that though she was clearly of African descent, she also had Brazilian roots. Her mother was reportedly of Royal African blood as well and became pregnant when she was raped by her white slave owner (which was another common practice during this time.) To cover his indiscretions, he then sold Anastacia’s mother to another slave master during the first half of the 19th century. After being sold as though she were property, Anastacia’s mother is believed to have given birth to her on March 5, though the exact year is unknown. As soon as she was born, there was something clearly very different about this baby. Escrava Anastacia had dark skin as was to be expected, but she also had bright blue eyes. She is also believed to be one of the first slaves born in the new world with blue eyes. A depiction of Escrava Anastacia, showing her brilliant blue eyes and beautiful dark skin accentuated by decorative flowers, but also shackled in her collar and face mask. Wikimedia. In addition to having a stunning pair of eyes, Anastacia is said to have been statuesque as well as having a beautiful face go along with it. Instead of making her life easier as is sometimes the case, her beauty actually made her the target of jealousy and more abuse. If she was as gorgeous as they say, it is no wonder that women in particular had a disliking for her, especially the white women who had interactions with her owner. These women were reportedly so jealous of Anastacia’s looks that they convinced her owner’s son to place her in an iron collar and muzzle. There are some who disagree with this being the reason that Anastacia was placed into the collar. Some say that the muzzle was a form of punishment for trying to aid slaves in escape attempts, or stealing the sugar from the plantation on which she worked. There is also speculation that this punishment had nothing to do with disobedience or the jealousy of other women, but with the fact that Anastacia refused the sexual advances from her slave master’s son, Joaquin Antonio, even though he was reportedly obsessed with her. Placing Anastacia in the iron face mask did more than just change her physical appearance. The type of mask that they put her in is often referred to as a scold’s bridle. Though the one they used on Anastacia looked a bit different, the premise was the same: to humiliate the wearer as well as physically keep them from speaking. No matter the variation of the mask, the general construction works by either compressing the wearer’s tongue flat or to the roof of their mouth, rendering them unable to talk. Having to wear this continually resulted in fatigue of the mouth and jaw as well as excess salivation and even trouble breathing at times. This type of punishment was most commonly used on women and slaves; Anastacia happened to be both. 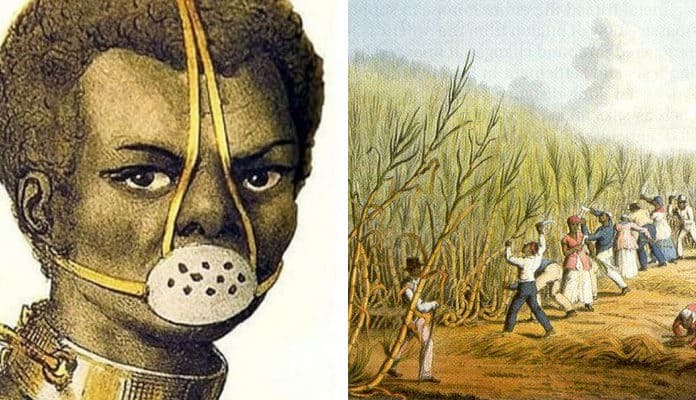 Most of us would think that having to wear a mask of this type would be punishment enough, especially on top of the hard daily labor of working on a sugar plantation. It appears Anastacia’s owners were particularly cruel, as she was reportedly raped before being condemned to wear the collar and mask for the rest of her life. Forced to wear this mask all day, everyday, she was also only allowed to have it off once a day in order to eat. Despite the fact that she was ridiculed and harassed on a daily basis and forced to wear that horrible iron contraption, she is said to have retained her sweet and peaceful nature. Many in her community sought her out, as well, due to her being rumored to have miraculous healing powers. Anastacia is said to have even healed her master’s young son before she died . How did she die? After being forced to wear this collar continuously, over time the iron that it was made out of is believed to have essentially poisoned her. So not only was she working in sugar cane fields all day while wearing this mask, only being fed once a day, it turns out she was slowly being poisoned to death as well. Anastacia died of tetanus after suffering physically for who knows how long, yet she still extended forgiveness to her owner and his family before she passed on. As she was highly respected by her fellow slaves for her healing abilities and kind nature during her lifetime, once she died, those same people revered her even more. The story of her life began to spread and many began to see Anastacia as a true representation of the struggle of black slaves in Brazil. As time passed, she became a symbol of the resistance that began to rise in protest of the oppression of her people, and in the eyes of many this made her a saint. In the early 20th century is when images of a black woman with stunning blue eyes and wearing a face mask began to circulate along with the legend of Anastacia. Her status as a saint became more widely accepted in 1968, with the creation of an exhibit in her honor at the Church of the Rosary of the Brotherhood of St. Benedict in Rio de Janiero. This exhibit spurned more interest in the legend of the beautiful African woman with the blue eyes and mystical healing powers. The Brotherhood that first presented this exhibit then began collecting stories about her life, which is possibly one of the reasons why there are so many different versions of her life. Despite the noble life she is believed to have lived under extremely harsh circumstances, Anastacia is actually not an official saint that is recognized by the Catholic Church. In 1987, the Catholic Church actually claimed that Anastacia never existed and ordered that her image be removed from all church properties that paid homage to her. These images were removed from official church property but over the years there have been many shrines that have been erected elsewhere for people who saw this woman as their patron saint. Although efforts have been made by the Catholic church to remove Anastacia’s association with the Catholic religion, their actions may have come a bit too late. By the time the church decided to intervene, word of this woman’s life and actions had already spread, therefore making her legend almost impossible to kill. Today, there are still movements going on to have her officially canonized by the Catholic church. All actions that the church has taken to distance themselves from this remarkable woman have failed. Whatever her true story may be, the tale of Escrava Anastacia is one that has left an imprint on the world, shining a light on to the dark side of colonialism and the horrors of slavery. The transition from slave to saint is not a journey that many make in this lifetime, but this beautiful and honorable slave girl managed to do just that. As an unofficial patron saint of women, slaves, prisoners and the poor, many still pray to her today for healing, patience while feeling oppressed, and for the strength to brave their daily circumstances. The story of Anastacia is one shrouded in mystery, but, regardless, is one that gives hope to many. The Legend of the Martyred St.Escrava Anastacia. The Vintage News. Brad Smithfield. February 16,2018. Slave Tortures: The Mask, Scold’s Bridle, or Brank. US Slave. September 23, 2011. Escrava Anastacia: The Legend of the Enslaved Saint with Blue Eyes and Healing Powers. Jai Jones. October 13,2018.